My 2007 oil painting One Fine Day soon will conclude its five-month long exhibition at at McGuire Real Estate Gallery in Elmwood District, Berkeley. 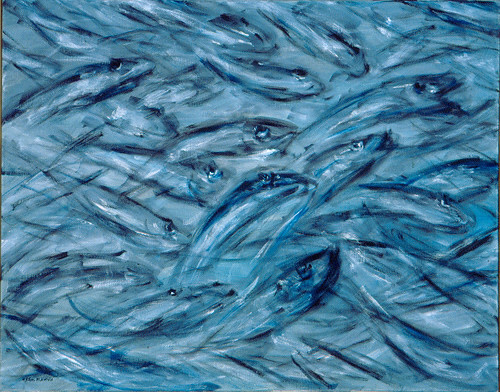 This painting, in somewhat sickly moon light tone (pale Prussian blue), depicted a school of agitated and thrashing fish, tightly packed in confining space, bulging eyes telegraphing anguish, straining to escape of a deadly trap they had unfortunately fallen into. The ironic title I chose, perhaps ought to be ascribed to some lucky fishermen. And that spoke the volume of the relationship of mankind and the unfortunate nature.